Giveaway: Tickets to the Cake and Bake Show in Manchester! The hottest show in the culinary calendar is coming to Manchester! If you enjoy a spot of baking, decorating or indeed eating cake for that matter, the Cake and Bake Show is the place to be. I have my tickets... do you? No? Don't panic! I have FIVE (you heard...) pairs of tickets to give away. Whether you're interested in learning new skills, watching a show, meeting your idols, sourcing something tasty, entertaining the kids or just a look round the exhibition, there really is something for everyone at the Cake and Bake Show. Competitions Theatre where you can compete with folk off the telly! VIP tickets will be available meaning you get fast tracked into the show and get front row seats at a demonstration of your choice! Simply follow the instructions on the Rafflecopter widget below - all entries will be checked and verified before a winner is announced. You can increase your chances of winning by entering via all the methods listed in the widget. Some can be done daily. The competition runs from 27th February to 25th March 2013. Please see the Terms and Conditions on the Rafflecopter widget for more information. We have winners! 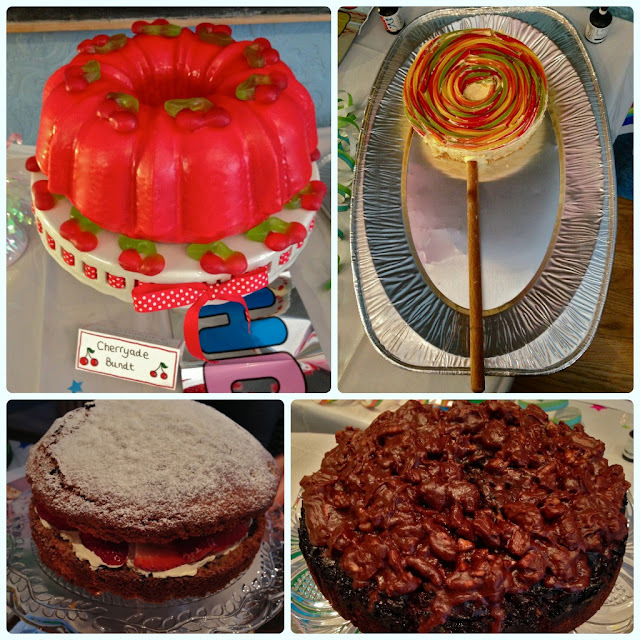 The lucky folk going to the Cake and Bake Show are Resma Patel, Nicola Thomas, Zoe Howarth, Gillian Glynn and Desiree Riding! A year ago today I was still pumped full of a heady mixture of sugar and adrenaline from the success of our very first Bolton Clandestine Cake Club. 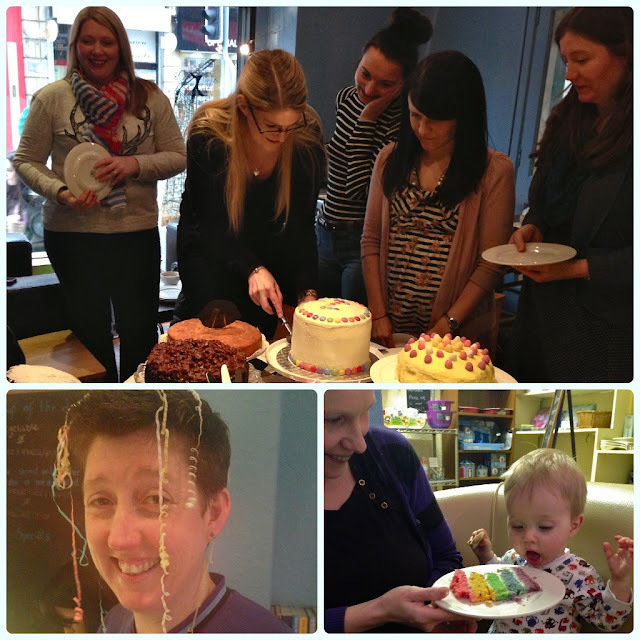 On Saturday our little club celebrated a whole year of baking, talking and eating cake together. Over 12 months we have devoured 263 cakes, gathered 102 members, had two babies, hosted visits from four different clubs, brought custom to seven new venues and had one 'virtual' club when we were hit with snow. 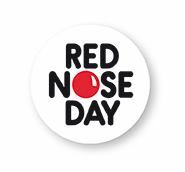 Our members even helped Dawn and I with two local events, raising around £2500 for Bolton Neo-Natal Unit. Not bad eh? Our theme for Saturday's meeting was 'One'. I asked our bakers to bake the one thing that they love, which is worthy of a celebration. 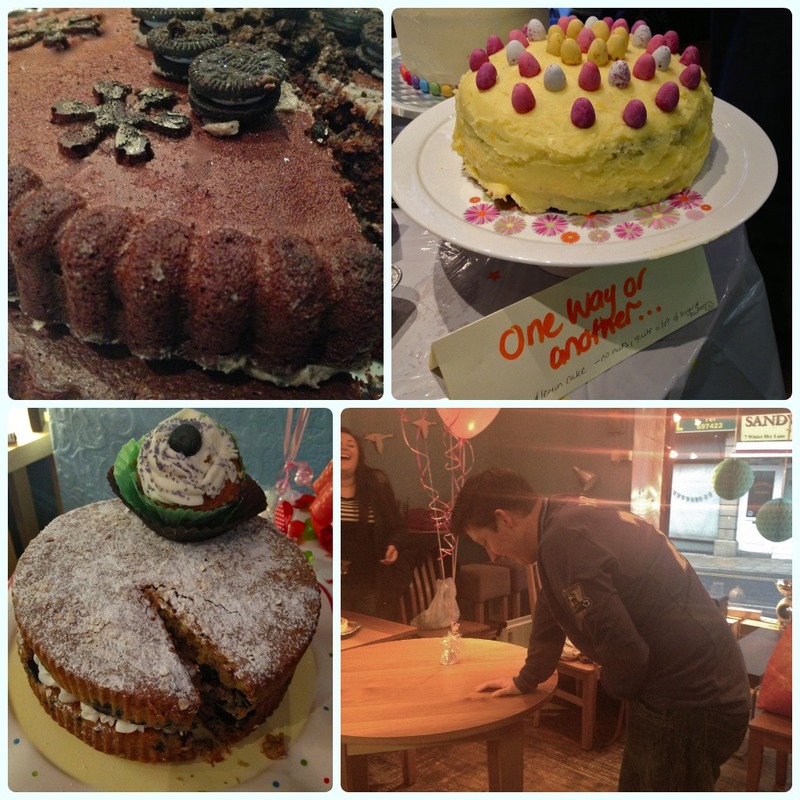 By popular demand, the Bolton Clandestine Cake Club went home to Thyme Deli in Horwich. Amanda (Thyme's owner) has been hugely supportive of our club from day one. She has welcomed us with open arms whenever we have asked. She hosted our very first meeting, brought us in from the snow when Horwich was under about a foot of the stuff, tolerated our crumbs and cake dramas and didn't seem to mind when we gave her children enough cake to keep them on the ceiling for a month. 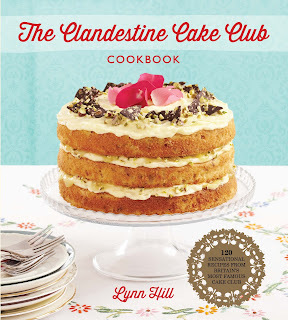 To say thank you for all her support, our club presented Amanda with her own copy of the Clandestine Cake Club Cookbook. I cannot thank her enough! 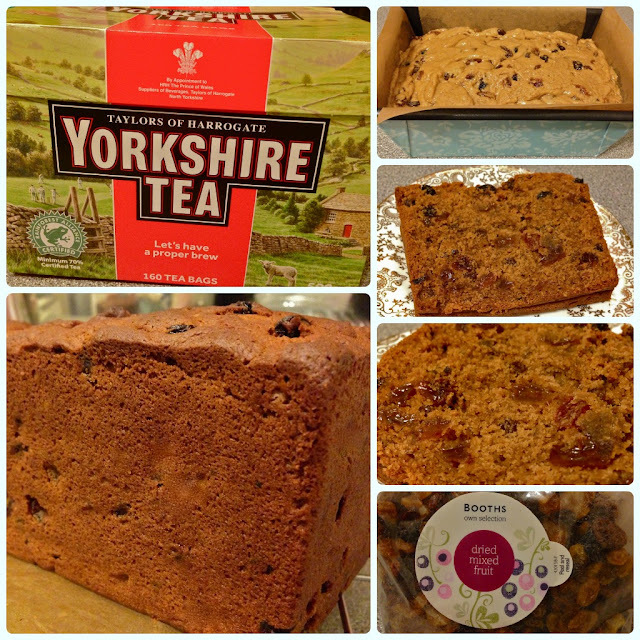 This week I have been inspired by our new Clandestine Cake Club sponsor, Yorkshire Tea. When the news was announced, every man and his dog seemed to agree that they make a cracking cuppa! I like my tea strong with a tiny bit of milk and no sugar; pretty much the same colour as this cake actually, although at work it's described as a 'David Dickinson'. So this week's mid-week bake had to be some sort of tea loaf. Tea and cake are the perfect partners, so I thought I'd spruce up a traditional recipe with our favourite brew and a little spice. I've called this recipe a tea cup loaf because it uses a tea cup to measure! This is a really simple recipe and can be made with little effort. You don't even need to soak the fruit (avoids the death stare from the tea loaf purists...). The result is a large, moist loaf which is bob on with a nice cup of Yorkshire Tea. Add the tea, butter, fruit and sugar to a large, heavy saucepan and mix on a low temperature until everything has melted. Turn the heat up to medium and bring to the boil. Simmer gently for 3 minutes. Put to one side to cool off. 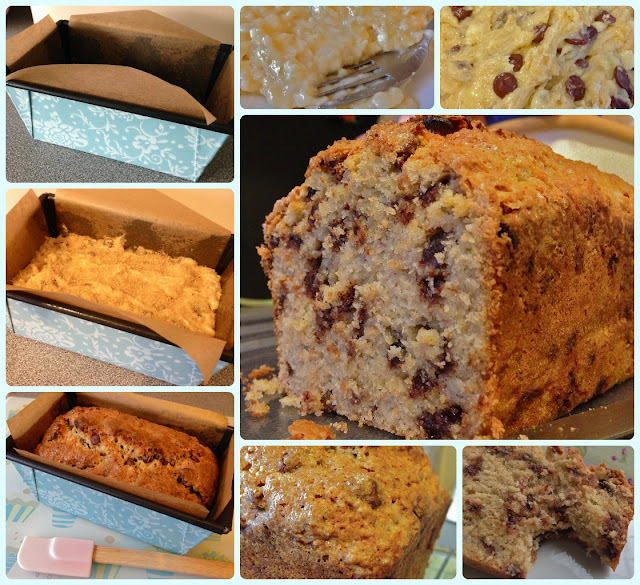 Grease and line a 2lb/900g loaf tin - this gives you something to do whilst the fruit mix is cooling! Sift the flour, spices and bicarbonate of soda into a large bowl. Pour in the warm fruit mix and mix until there is no flour visible. Pour into the prepared loaf tin and bake on gas 4/180 C for 1 hour. You'll know it's done when a skewer comes out clean. A couple of months ago we heard a little rumour... 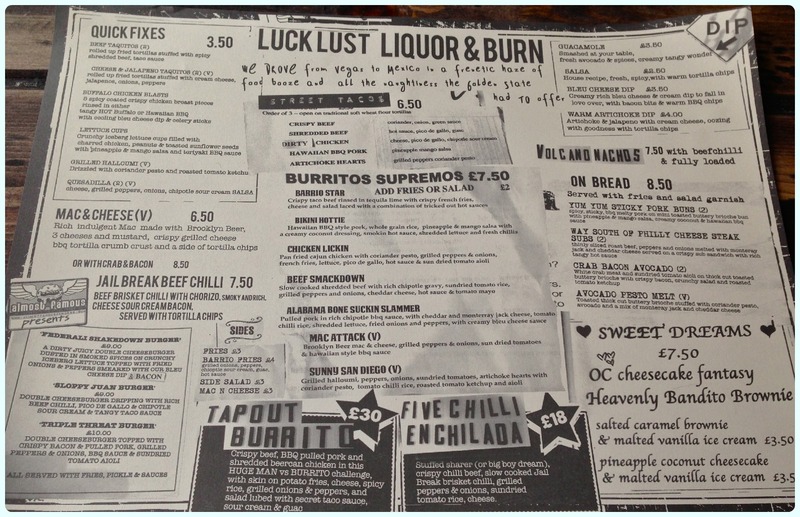 The burger whizz kids at Almost Famous were to call time on Socio Rehab in favour of a new gaff inspired by travels throughout western America. This is my kind of food! Burgers meet Mexican. ¡Ay, ay, ay! 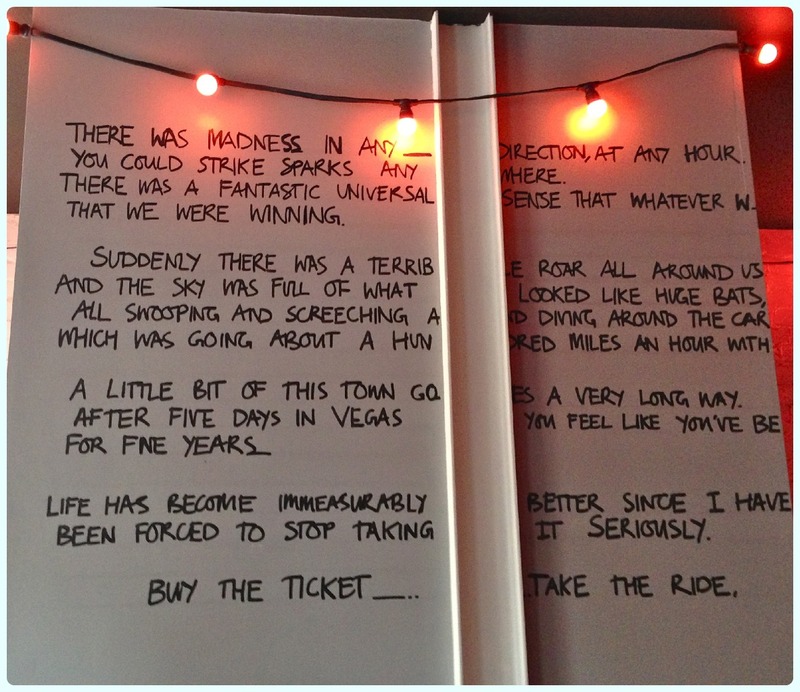 Having done a similar trip in September, I was dying to see what they came up with. The west coast of America is chock-a-block with melted cheese, oozing burgers, hot as hell wings and slow cooked meat wrapped in something soft. 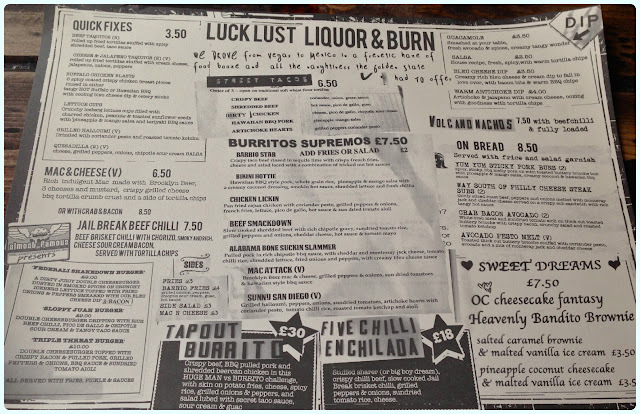 So on Sunday we popped down to Luck, Lust, Liquor and Burn to see what was going down. In true Almost Famous style, it was supposed to open at 12pm but they kept us waiting for about another fifteen minutes. I gather this is how they build a little suspense... 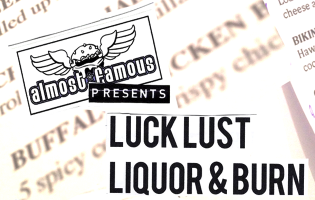 The restaurant itself is on the first floor between what was Socio Rehab (now the Luck, Lust, Liquor & Burn bar) and Almost Famous. 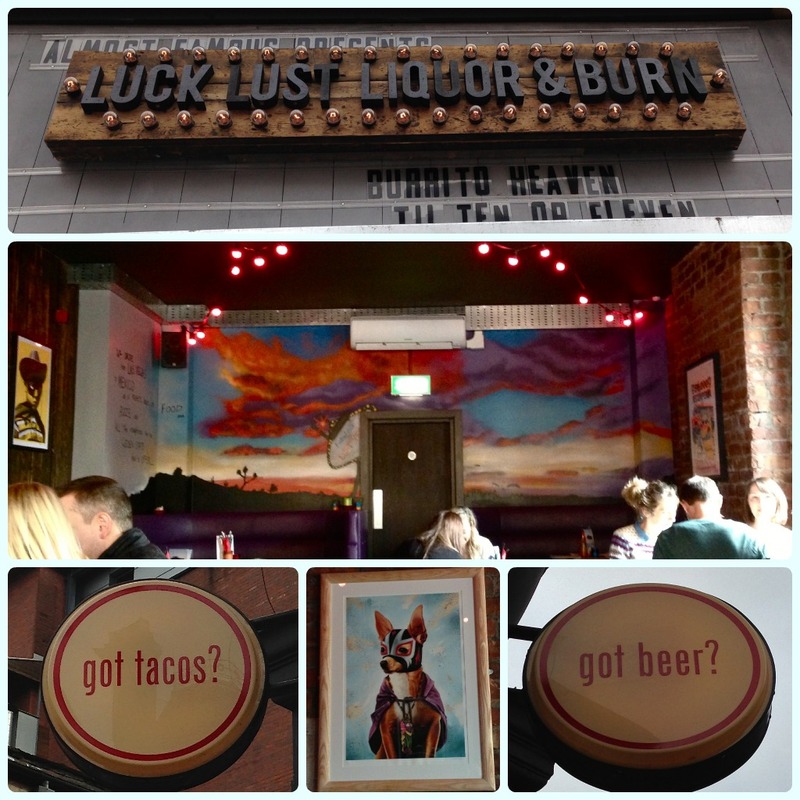 Inside is a bit of a mish mash of Americana and Mexican inspired artwork. My only complaint about the interior is that it's very cold. I went when the same room was being used for Miracle on High Street, and I nearly died of frostbite then as well. Saying that, I'm always cold... Plus, they had a picture of a chihuahua in a rather fetching Mexican wrestling outfit. I liked that! Now then. The menu. I genuinely struggled to pick. 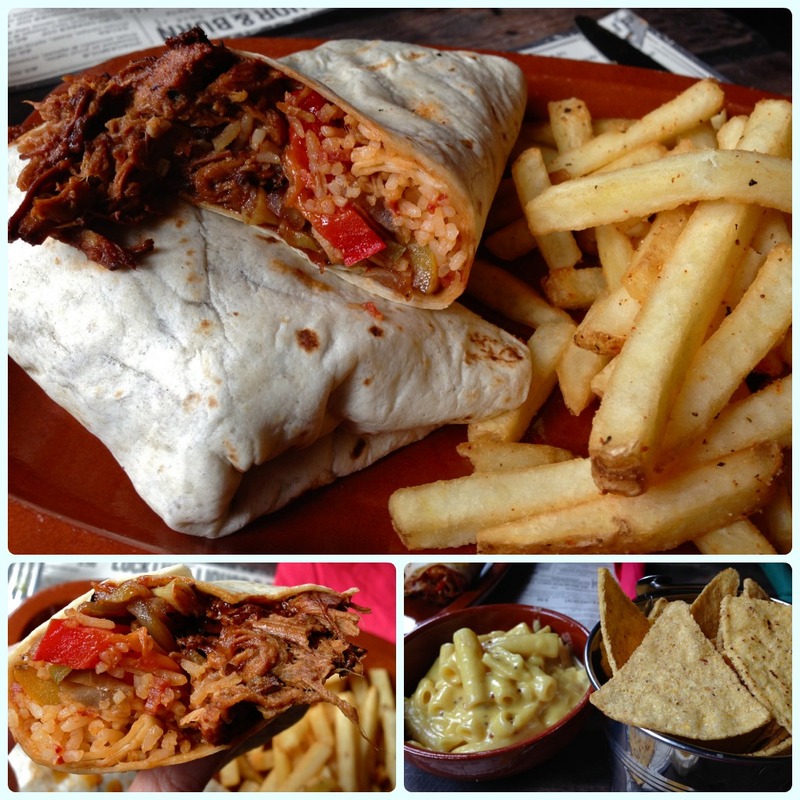 This is the sort of food I adore... burritos, rice, pulled pork... that nice belly warming sort of stuff that makes the whole table mute the second it appears. 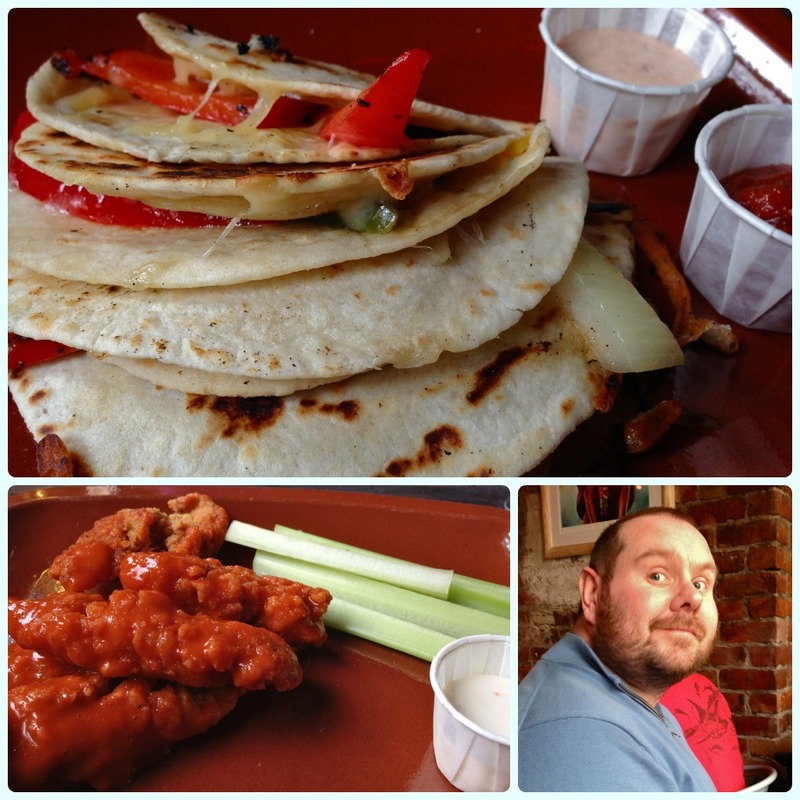 We went with our friends Wayne and Vicki and also bumped into fellow blogger and 'Tapout Burrito Superstar', Mr Hungry Hoss! Having been caught in the act stuffing our faces, it was nice to have a nosey at what he had ordered too! I'm fairly confident nothing left the kitchen without me eyeing it up. To start my husband and I shared the Buffalo Chicken Blasts with hot buffalo sauce and the (dang) Quesadillas. The quesadillas came with chipotle sour cream and salsa, and the chicken blasts were with celery and sour cream. Perfect picky food. The quesadillas stayed together nicely (I sometimes end up wearing things like this) and the chipotle sour cream stole the show! I'm confident that if Vicki and I had a tub of this and no audience, we could snaffle the lot. I'm not a fan of chicken wings because they make one hell of an orange mess. 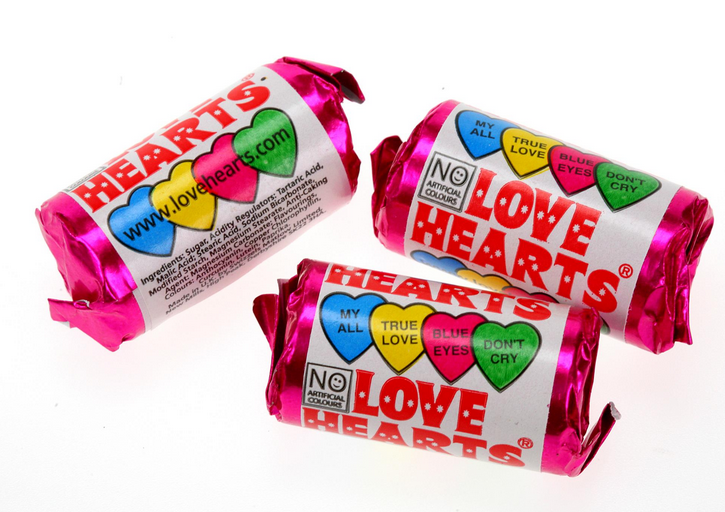 These were perfect as there are no bones in them! Everyone's a winner. Shameless plea to Luck, Lust, Liquor and Burn: ~sits with both hands under chin like a little angel~ Please recreate the chilli cheese sauce that is served with wings and burgers at Hooters! PLEASE! It's all kinds of amazing and nowhere over here does anything like it! Thanks. Burrito time. I was ravenous. Like a raven with a big beak. I had ordered the Alabama Bone Suckin' Slammer. It promised pulled pork, lots of cheese, rice, BBQ sauce and a soft tortilla. Oh it was just perfect! Exactly as I had imagined... I'm sorry to say that I displayed a very poor performance on Sunday and only managed half of it. Pathetic. It pains me now to think that I wasted it. Be reassured that they are huge! How Mr Hoss managed a whole Tapout Burrito (nice nod to MMA folks...) is beyond me. He's obviously some sort of burrito witch. My husband ordered the Sloppy Juan burger. I was so jealous when this arrived. This double cheeseburger is topped with the most fantastic chilli. He ate every scrap including his chips. Warrior like behaviour! Needless to say this too was fantastic. It was a nice little twist on the Almost Famous range. We also ordered two sides, guacamole (which is pounded before your eyes...) and mac and cheese. The only thing I didn't like was the latter. There was way too much mustard in it, to the point where I really couldn't taste anything else. A wise man once said, 'too much mustard gets up your nose'. It's my favourite baking book ever, and I've only had a copy for a few weeks. 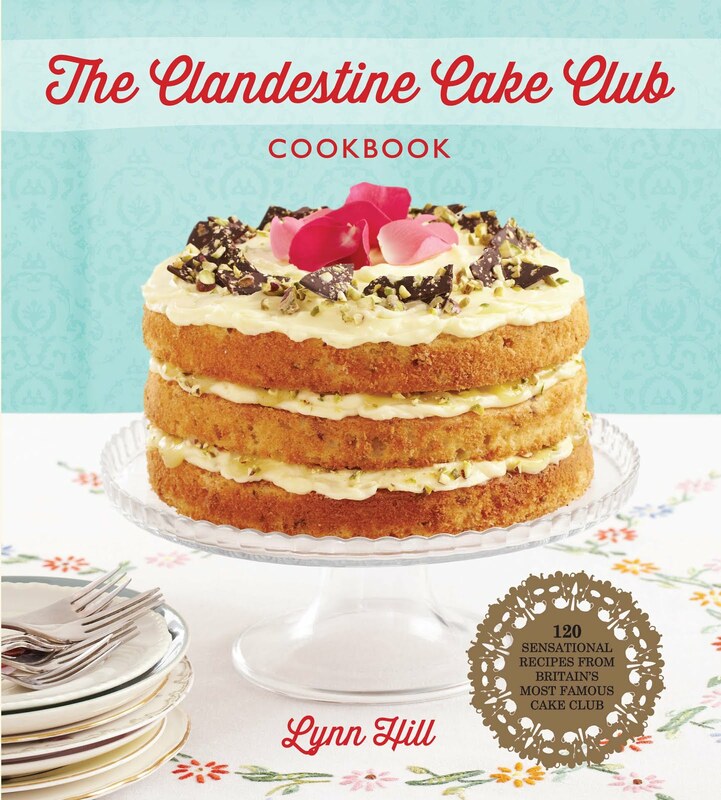 The Clandestine Cake Club Cookbook by Lynn Hill is a comprehensive collection of fantastic recipes fresh from the kitchens of the club's members. Each has been lovingly perfected in our homes, gathered by our leader Lynn Hill and bound in this beautiful book by the creative whizz kids at Quercus Books. Victorian Cakes - pretty bakes inspired by historical tales. 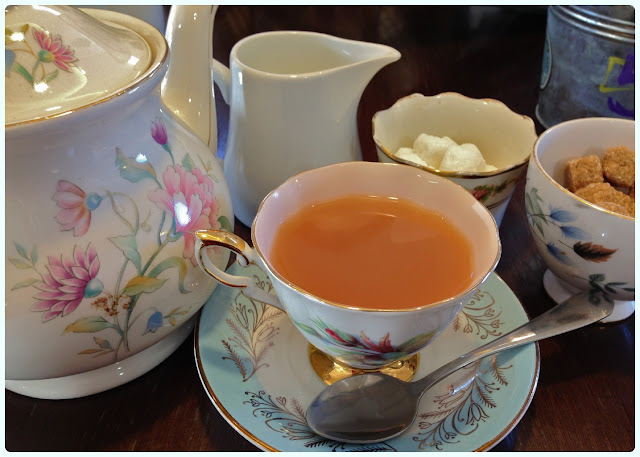 Pastel Battenberg, floral concoctions and tales of the empire remind us of the very first meeting held in Leeds in 2010. Fruity Cakes - ahem... they're part of your five a day... A chapter jam packed with beautifully moist cakes including rhubarb, plums, pears and apples. Pretty as a picture! Chocolatey Cakes - the cakes we only ever manage a slither of at cake club, yet somehow have the strength to devour a whole slice later that night... Oozing centres and glossy ganache fill these pages. 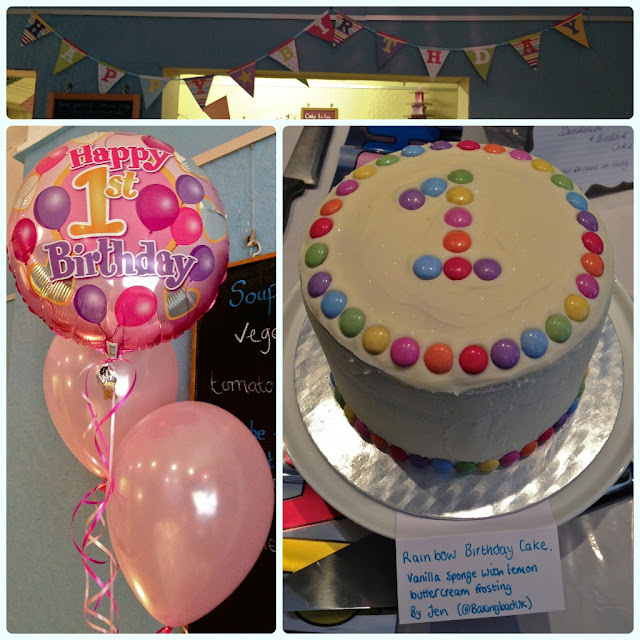 Celebration Cakes - it's all about the pomp and ceremony here! 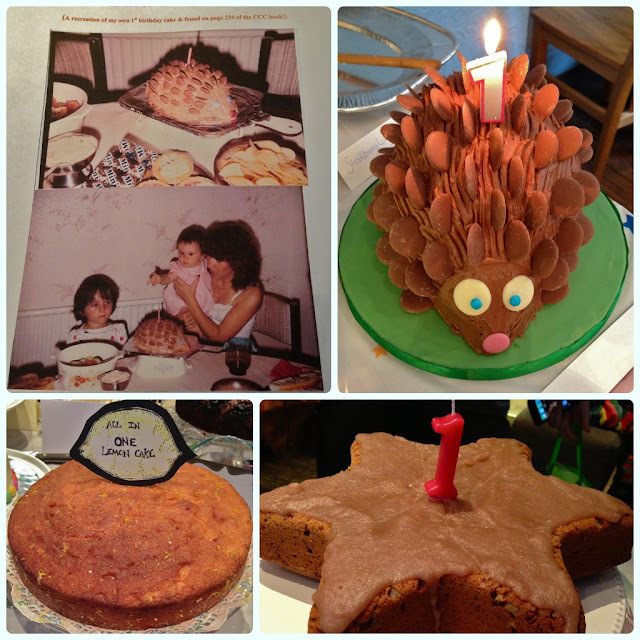 We celebrate all year round with a variety of wonderful cakes, including champagne, spices and of course some beautiful festive bakes. 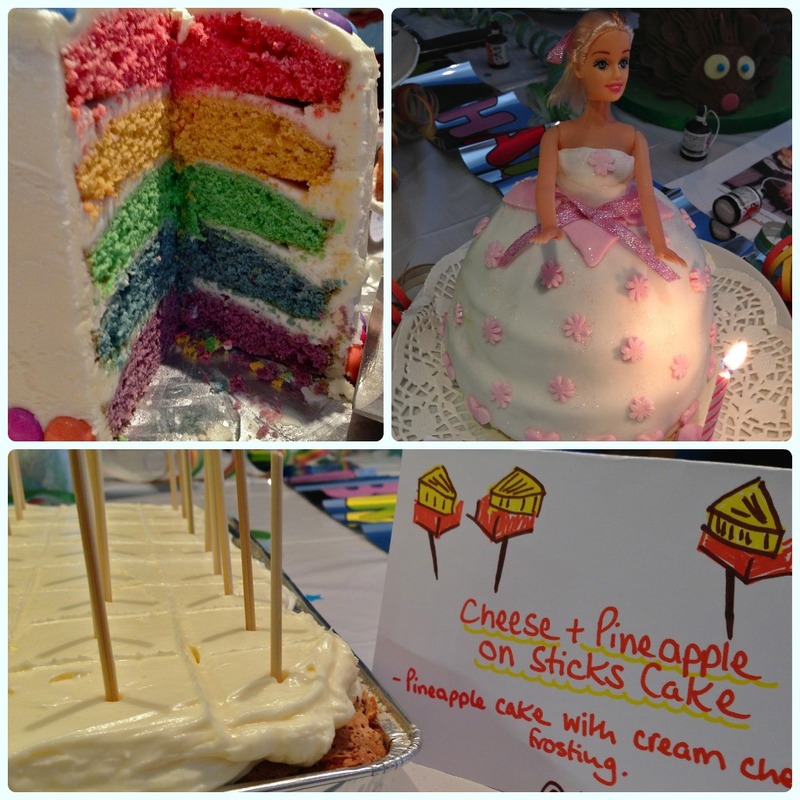 Creative Cakes - we love a bit of imagination at cake club! Our varied themes mean that we never get a plain sponge. Expect crazy colours, toppings and variations on a theme here. Zesty Cakes - perfect for any occasion and a real crowd pleaser. So popular in fact, they have a section of their very own. It goes on general sale on 14th February 2013, RRP £20. 'How do I enter?' I hear you cry! The competition runs from 5th February to 28th February 2013. Congratulations to the winners... Mel Briscoe and Caroline Muspratt! We've been going to 'The Tavern' as we call it since I was a little girl. This is probably for about twenty five years. It's seen many changes, but a lot of the faces have stayed the same for years. I can't quite believe I've never blogged about it before! Sometimes it's the most obvious places that I forget about. Before I go any further, I want to get one thing straight. This is not a '2 for 1', ready meals from a freezer type of gaff. Although the building is large, it is privately owned and run by staff who are friendly and knowledgeable. The Tavern has a large bar serving a number of cask ales (including the likes of Black Edge Brewing, Dunscar Bridge, Prospect, Three Bs and Penning Brewing Company), a comfortable lounge with squashy sofas and roaring fires, and a sizeable restaurant area. When I was a little girl we would go to the Tavern for chicken in a basket and an elaborate knickerbocker glory jar filled with strawberries. By my teens, they had done some extensive building work and made the pub much bigger. This is when I discovered their amazing gammon steaks. By the time I was in my early twenties, my husband (then boyfriend) and I went at least twice a week. Now I have turned thirty, I am still going for their amazing gammon. It never gets old. Allow me to explain. 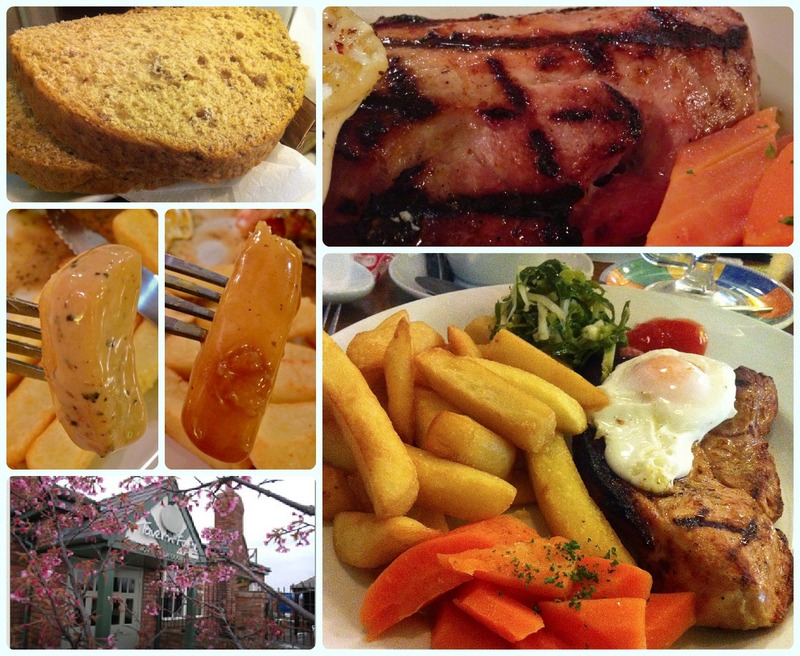 Gammon at the Tavern is at the top of its game. It's thick, juicy, not too salty and comes with beautiful charred marks on the outside. I have had good gammon elsewhere, but nothing quite compares to this. I can honestly say that it has been constant in quality for at least the fifteen years. Their chips are pretty special too. Crisp on the outside, fluffy on the inside, and always piping hot. Vegetables are fresh and perfectly cooked. This is traditional British home cooking at its best. Every now and again (if I'm feeling cocky) I get something other than my beloved gammon steak. They do a brilliant beef roast, chilli and different pies. Although the menu is quite large, they execute it well. 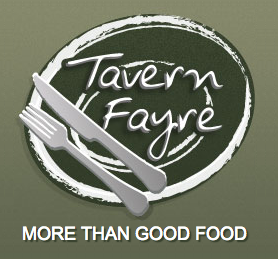 The Tavern is perfect if you have a fussy eater in your group too. Not only can you customise your dish to suit your tastes, but there is a wide variety of meals ranging from spicy to the type of things my dad likes. My little friend Sally doesn't actually eat much real food. She could quite easily live off chips and astrobelts. Basically she has the palate of a 75 year old chap. Meat, carbs and gravy. Needless to say the Tavern is her favourite restaurant! There's plenty on the menu for her as well as everyone else. Did I mention that they also do a mean pepper sauce? I love it. My husband opts for gravy instead. Now then. Desserts. Granted, they don't make their own. However, they get these bad boys below from some sort of gateaux genius. 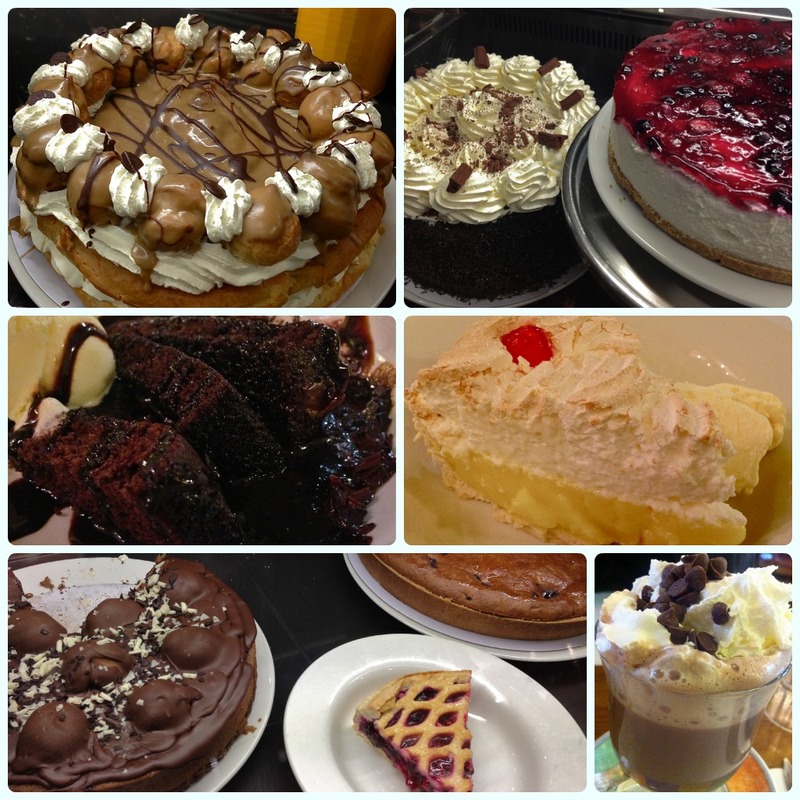 Think layers of cream, meringue, fruit, choux pastry or oozing chocolate and toffee, all served with your choice of cream, ice cream or custard. As well as the gargantuan sweets in the display chiller, there are more hot desserts like sticky toffee pudding, apple pie and hot chocolate fudge cake. On Sunday my husband had the hot chocolate fudge cake, whilst I opted for a huge slice of lemon meringue pie. If the Tavern was situated in the heart of Rivington and was half the size, they could probably charge twice what they do in Westhoughton. Don't be fooled by the size or the signage. There is nothing standard about this place. Simple food done well should never be underestimated, neither should consistency. I can't ever recall having a bad meal here, and I'm sure we'll be going for many years to come. This recipe is sooo easy. It's the kind of cake I don't even switch my mixer on for. This is a bowl and a spatula kind of job. It's also an easy one for children to make. It yields excellent results every time, and folk generally think you are very clever, even though you barely had to lift a finger! 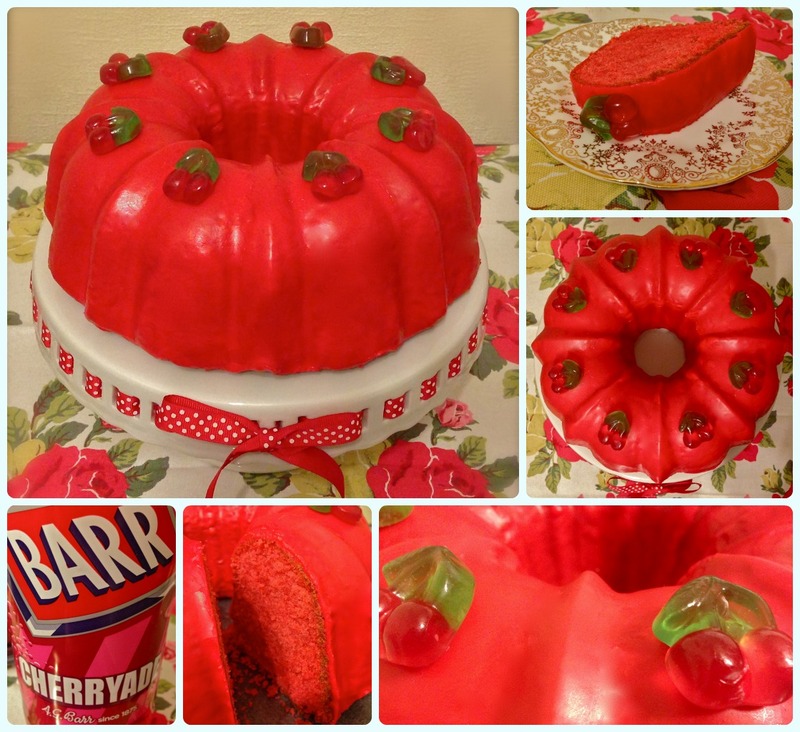 This is a cake I used to make regularly before I became obsessed with all things bundt. I hate bananas, yet some weird cake alchemy makes this cake utterly irresistible. One of my work friends won't touch any fruit related cakes, but adores this one. I like to think that the chocolate rebalances the healthy/unhealthy seesaw. The cake feels very heavy if picked up as a whole, but its texture is light and fluffy. The addition of demerara sugar on top means you get a lovely crispy outer shell which is a wonderful contrast to the soft centre. I decided to make this recipe when I was kindly given a loaf tin by George Wilkinson's; the makers of Great British Bakeware. I wanted to know if these tins were functional as well as pretty to look at. As this is a recipe I have made many times, it was the ideal choice. The tin behaved wonderfully! No warping, even baking, easy release and a dream to clean afterwards. I really liked the fact that the edges were cool enough to handle after the cake had cooled for ten minutes too. Just makes life easier! 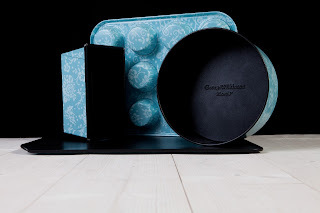 I'm currently running a competition on my blog to win a set of these limited edition vintage floral tins. Make sure you enter before 28th February 2013! Alternatively, you can purchase them from Amazon. Grease and line a 2lb loaf tin (this can also be split into 2 x 1lb tins). Pre-cut pleated liners are pretty useful here! Mix in the melted butter - it will be thick with remaining flour round the edges. Do not fret. Fancy something a bit different? You can substitute the chocolate chips for fudge pieces, dark chocolate, nuts or a mixture! Disclaimer: I was given this tin by George Wilkinson's because I am currently running a competition to win the range. I offered to review one of the range to ensure I was happy with the items. 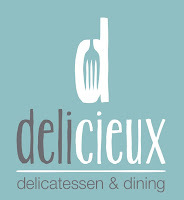 I had mixed feelings about going to Delicieux. I wasn't a huge fan of the business which was on this site before it, and I already have my local favourites. However, being a right nosy Parker I also felt I had to see what they had on offer. It's always been an awkward place for a business. Delicieux is on the roundabout where Chorley Old Road and Moss Bank Way meet, and doesn't benefit from being on a main high street amongst other shops. McDonalds is a short walk away, and seems to do well in this area. Therefore attracting visitors from elsewhere is key. Parking was always an issue when this building was Zest. We regularly chose to drive past rather than go in because there was no obvious place to park. However, the bottom car park is now more accessible to customers and today we didn't have a problem. The stark white building has been given a new lease of life with strong pastel stripes on the side, and pretty new signage. It caught my eye because the colours reminded me of my favourite spot in Horwich, Thyme Deli. 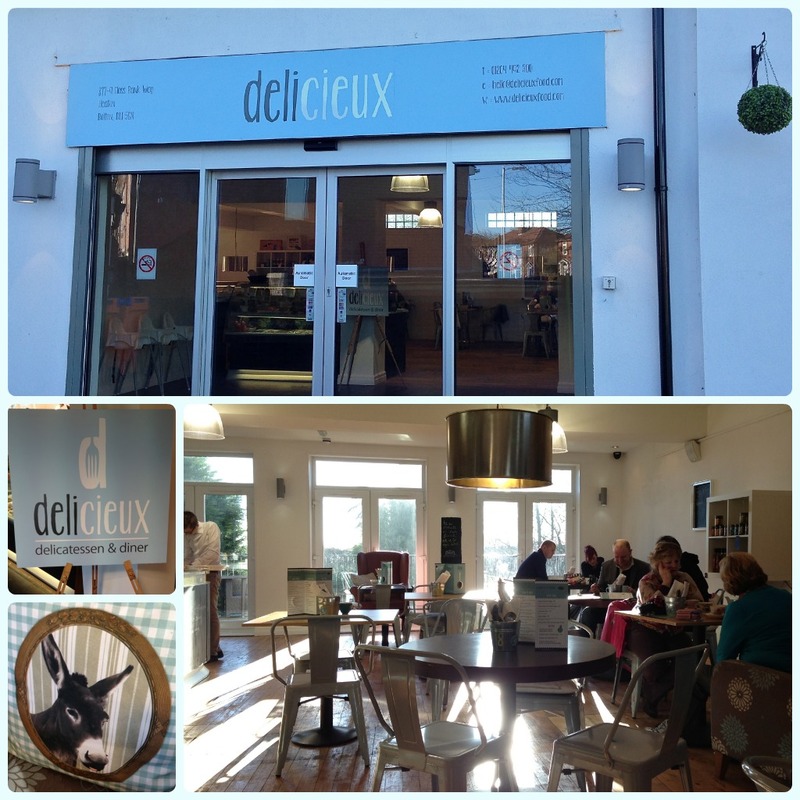 Walking into Delicieux feels very different to when it was Zest. It's much more homely and the new soft furnishings add a little comfort to what was previously quite a severe dining room. I had a chat to the owner, Debbie about some of the mouth watering produce in the chillers by the tills. 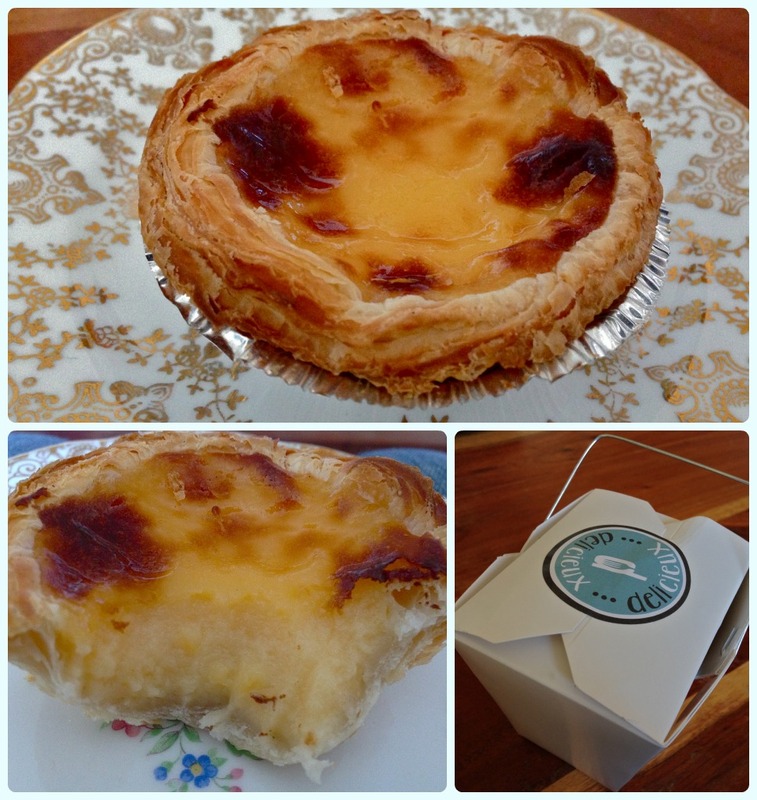 There was a fantastic array of pastries, cakes, savoury snacks and tarts, as well as treats to take home. She said she has really tried to create something which is different to other establishments locally. Delicieux is like an eclectic mix of Sugar Junction, Thyme Deli, Breda Murphy and Home Sweet Home; I'm sure for that reason that the girls at the Afternoon Tea Club would love it here! Although a lot of the food is cooked fresh on site, they also utilise local suppliers too. There were all day breakfast and Cumberland scotch eggs made by 'The Happy Belly' and breads, cakes and pastries from Hunter's Bakers - both based in Bolton. Our friends Kevin and Lucie have been a couple of times already, and recommended the full English. We couldn't see any breakfast items on the menu, but when we asked the young chap serving us, he explained that they did bacon or sausage sandwiches and the 'breakfast platter'. 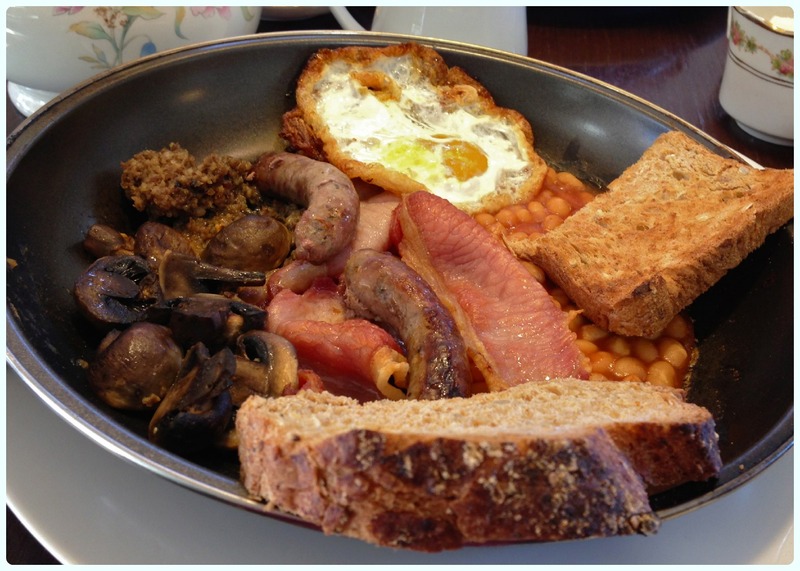 This consisted of bacon, egg, sausage, beans, tomatoes, mushrooms, haggis and toast, all served in a frying pan! It would have been rude not to! My husband asked for his without tomatoes and mushrooms and I asked for no mushrooms. I think we confused them slightly as I ended up with mushrooms but no tomatoes. I wasn't too bothered so carried on regardless. The bacon was nice and crisp, the sausages had a warm spiciness to them and it turns out I like haggis. I can't recall ever trying it before, mainly because I presumed it would taste like black pudding, which it doesn't. The tea comes served in lovely mismatched china, which I can't help but love. 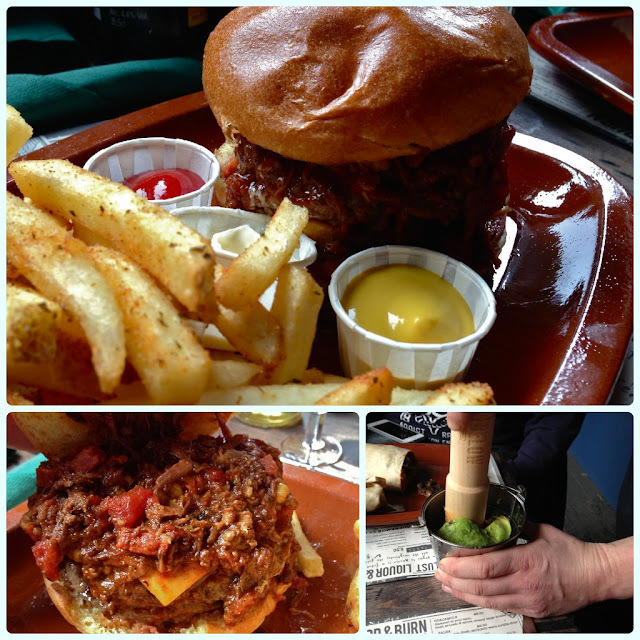 I was tickled half to death when three young lads rocked up to the table next to us and ordered burgers and tea. They looked so refined with their tea cups and 'down with the kids' jeans... Maybe this is a new trend amongst the youth of today... china. If this is the case, I am bang on trend. Although we went for breakfast, we spent our waiting time perusing the daytime menu, which I have to say looks great. Bread platters with cheese and cooked meats, triple cooked chips, pork pie soup with a ham hock slider (I know!) 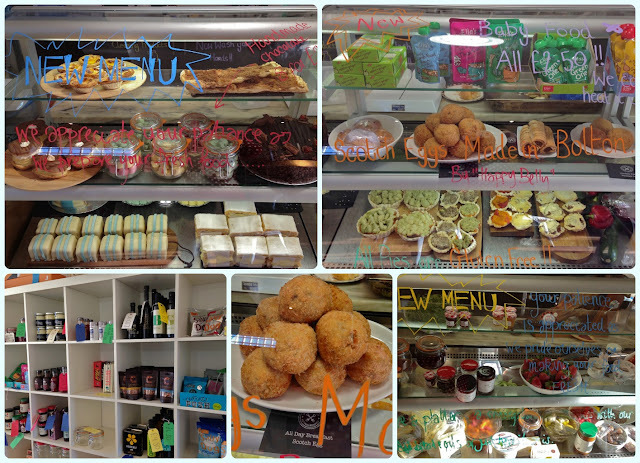 and signature desserts all caught my eye. We'll definitely be returning for lunch another time. Debbie and her troop are clearly still finding their feet and settling into serving the new menu, but they have only been open for a month. Thirteen days after they opened Debbie's face was burned by a faulty oven, but she was back in work the next day getting back on track. I'm pleased they seem to be offering something different, and I'm sure word of mouth will mean this is a popular little meeting place. What?! Hate Valentine's Day? In that case submit food that warms your heart and makes you happy! 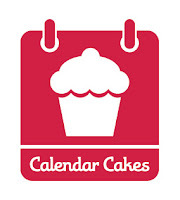 Pop over to my Cakendar Cakes tab to enter!